After their visit to the edge of insanity (and dissolution) that was "The Black Cauldron," Disney movies stepped back to slightly firmer ground with "The Great Mouse Detective" (1986), starring Vincent Price and directed by Burny Battinson, David Michener and Ron Clements and John Musker (the team of Clements and Musker going on to do "The Little Mermaid" and "Aladdin," stand-outs of the Disney Renaissance which one arguably could say began here). There were 12 writers credited with this tale (which derived from Eve Titus' children's book series), showing how carefully Walt Disney Pictures was taking this animated feature but also how much trouble they had putting it together. 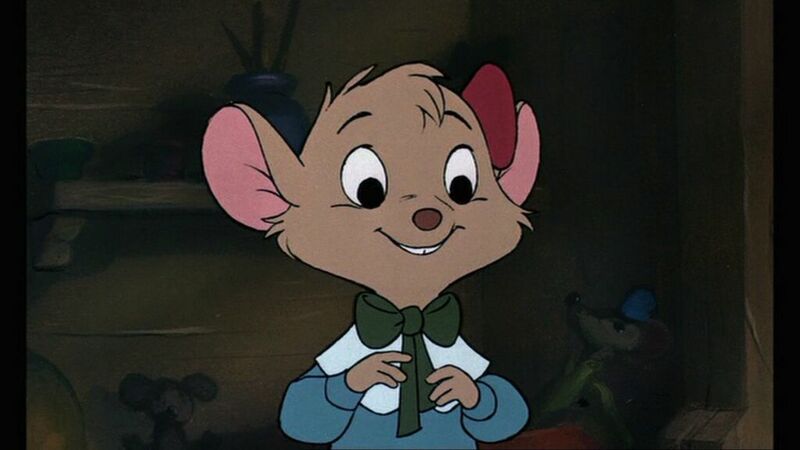 Since the concept of cute talking mice had worked so well in "The Rescuers" (and derived all the way back to the classic "Mighty Mouse,") the idea of more talking mice Disney movies seemed a natural for a recovery project like this. The strategy worked, and "The Great Mouse Detective" is one of the truly underrated gems in the Disney movie catalog. It has the unique distinction of having saved the animation department and is the true beginning of the Disney Renaissance. Basil (with Dawson) look someone else, perhaps? Hiram Flaversham: You can do what you want with me. I won't be a part of this-this... this evil any longer! Ratigan: Oh, very well, if that is your decision. 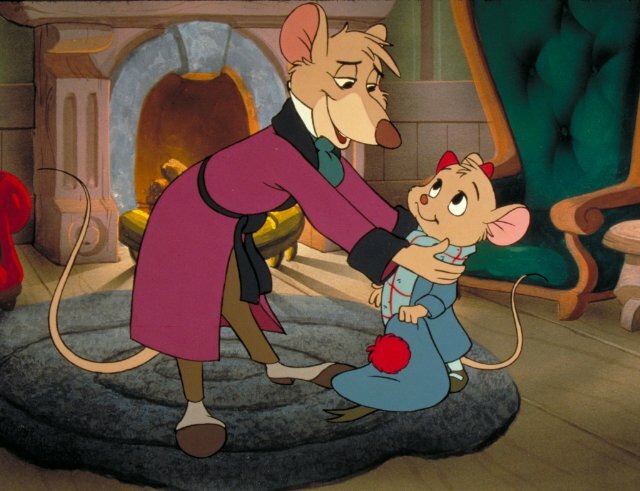 Ratigan: Oh, by the way, I'm taking the liberty of having your daughter brought here. 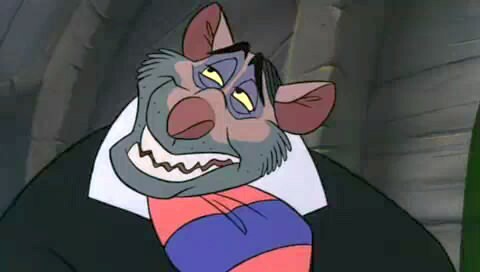 Ratigan: Yes. I would spend many a sleepless night if anything unfortunate were to befall her. Hiram Flaversham: You... Y-You wouldn't! Ratigan sends Fidget out to kidnap Olivia as well, then coerces Hiram into doing his bidding by threatening to feed her to Ratigan's pet cat Felicia. Olivia is not just waiting around, though. Before Fidget can kidnap Olivia, she is guided by Dr. Dave Q. Dawson to Basil of Baker Street, renowned mouse detective. Basil is very familiar with Ratigan. 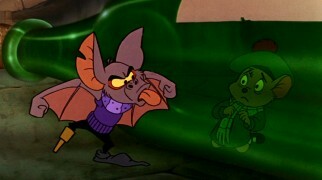 The mention of Ratigan's henchman Fidget convinces Basil that this may be his big chance finally to capture Ratigan. 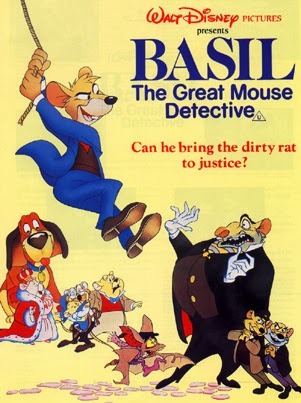 Basil and Dawson track Fidget using pet dog Toby (owned by Basil's neighbor Sherlock Holmes) and find him in the act of stealing clockwork mechanisms and other items for the planned mechanical mouse. Realizing he has been spotteed, Fidget grabs Olivia and runs, leaving Basil and Dawson behind. Using a checklist dropped by Fidget, Basil tracks him down to a waterfront tavern (the "Rat Trap") and thence to Ratigan's hideout. Ratigan, however, is prepared and captures Basil and Dawson, tieing them to a spring-loaded trap while he and Fidget go to Buckingham Palace to kidnap the Queen. 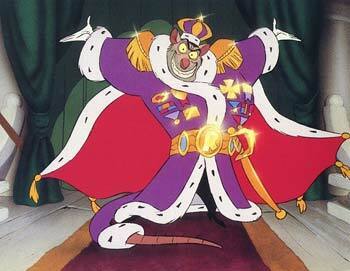 Hiram sets the mechanical mouse queen into operation, who immediately proclaims Ratigan the ruler of Mousedom. Basil, meanwhile, manages with Dawson to escape from the mousetrap and track Ratigan down, saving the Queen and arresting Fidget and his minions. Basil re-programs the mechanical mouse queen to make it announce to a crowd that Ratigan is a fraud and an imposter before the contraption self-destructs. Fleeing from the enraged citizenry, Ratigan escapes in a dirigible with Fidget and his hostage Olivia. Basil and the others follow in a craft that Basil manufactures, forcing Ratigan to throw Fidget into the Thames to lighten the load. Basil catches up and forces Ratigan to crash into Big Ben, where they have a huge fight. Basil rescues Olivia, and Ratigan, his cape stuck on the hands of the giant clock, is in for a big surprise when the clock bell tolls the hour. While Barrie Ingham voices titular star Basil, the undisputed star of this production is Vincent Price as Ratigan, who even gets to sing a big number, "The World's Greatest Criminal Mind." 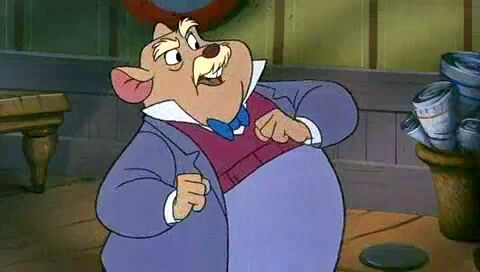 His character is based on Professor Moriarty of the Arthur Conan Doyle saga about the great detective Sherlock Holmes, and "The Great Mouse Detective" closely follows the plot of Doyle's final confrontation between Moriarty and Holmes. As usual with hammy villains, it is difficult not to root for Ratigan and hope that somehow he can escape despite all of his perfidy. Alan Young is engaging as Hiram, while Val Bettin as Dawson, Candy Candido as Dawson, Susanne Pollatschek as Olivia, Frank Welker as Toby and Eve Brenner as the Queen round out the leads. 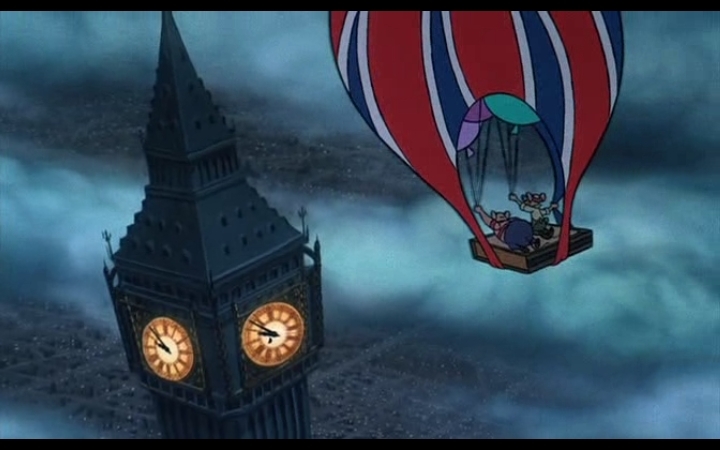 Disney movies were moving into the computer age during the genesis of "The Great Mouse Detective," and there is some CGI animation during a chase scene inside Big Ben. 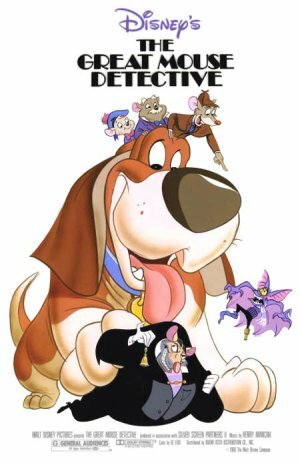 While "The Black Cauldron" was the first Disney movie to use any sort of CGI, "The Great Mouse Detective" advanced the art and used it in a popular Disney movie. Video cameras were used to replace some pencil testing as the digital age of animation started to pick up. The animation for the most part, though, is hand drawn in classical style using the xerographic process, with sharp colors and nice stylistic flourishes. Henry Mancini and Melissa Manchester worked on the soundtrack, with Vincent Price singing "The World's Greatest Criminal Mind." Students of Holmes films will spot numerous references and homages to actors who played characters in those films down through the years as well as other stalwarts of British cinema, including Basil Rathbone, Nigel Bruce and Leslie Howard. 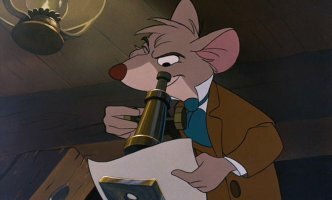 "The Great Mouse Detective" is a respectful homage, extending the Holmes franchise into a new realm and not satirizing or mocking it. "The Great Mouse Detective" was popular upon release, earning Disney some good coin and admiring reviews, and has resulted in several re-releases and home video products over the years. The "Mystery of the Mist" edition came out in 2010, and the Blu-ray version appeared in 2012. Unlike earlier home video releases, these two most recent versions are in widescreen format, making them the ones to find. 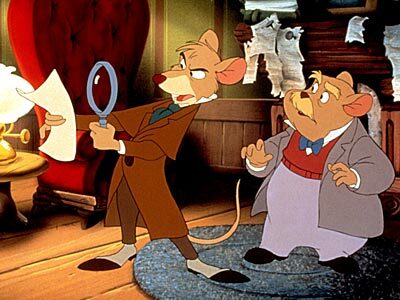 "The Great Mouse Detective," like "The Rescuers," is one of the forgotten gems of animation and is very enjoyable. It is stylish and breezy, with a great concluding chase scene and fast-paced throughout. Kids will love the cute animal characters, while adults can focus on the quite amusing plot and hammy characterizations. A Disney movie with cute, adorable talking mice is unbeatable. Throw in the always-hammy Vincent Price in one of his last acting appearances and "The Great Mouse Detective" is a Disney movie that just about anyone can enjoy. A mild financial success (earning $25 million on a $10 million budget), "The Great Mouse Detective" rejuvenated the Disney animation department and paved the way for the Disney Renaissance of the 1990s.